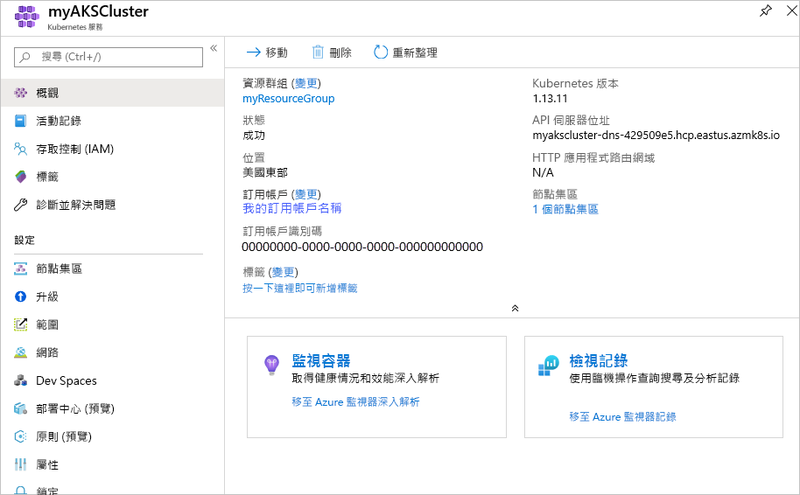 Azure Kubernetes Service (AKS) 是受控 Kubernetes 服務，可讓您快速部署及管理叢集。Azure Kubernetes Service (AKS) is a managed Kubernetes service that lets you quickly deploy and manage clusters. 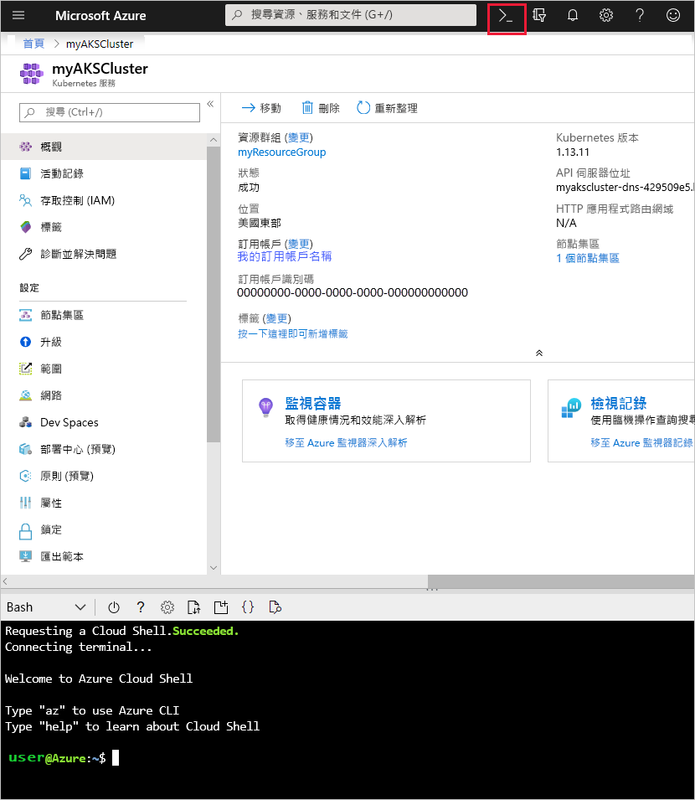 在本快速入門中，您會使用 Azure 入口網站來部署 AKS 叢集。In this quickstart, you deploy an AKS cluster using the Azure portal. 在叢集上執行包含 Web 前端和 Redis 執行個體的多容器應用程式。A multi-container application that includes a web front end and a Redis instance is run in the cluster. 然後，您會了解如何監視叢集的健康情況和執行您應用程式的 Pod。You then see how to monitor the health of the cluster and pods that run your application. 本快速入門假設您已有 Kubernetes 概念的基本知識。This quickstart assumes a basic understanding of Kubernetes concepts. 如需詳細資訊，請參閱 Azure Kubernetes Services (AKS) 的 Kubernetes 核心概念。For more information, see Kubernetes core concepts for Azure Kubernetes Service (AKS). 如果您沒有 Azure 訂用帳戶，請在開始前建立 免費帳戶 。If you don't have an Azure subscription, create a free account before you begin. 在 https://portal.azure.com 登入 Azure 入口網站。Sign in to the Azure portal at https://portal.azure.com. 在 Azure 入口網站的左上角，選取 [建立資源] > [Kubernetes 服務]。In the top left-hand corner of the Azure portal, select + Create a resource > Kubernetes Service. 專案詳細資料：選取 Azure 訂用帳戶，然後選取或建立 Azure 資源群組，例如 myResourceGroup。PROJECT DETAILS: Select an Azure subscription, then select or create an Azure resource group, such as myResourceGroup. 輸入 Kubernetes 叢集名稱，例如 myAKSCluster。Enter a Kubernetes cluster name, such as myAKSCluster. 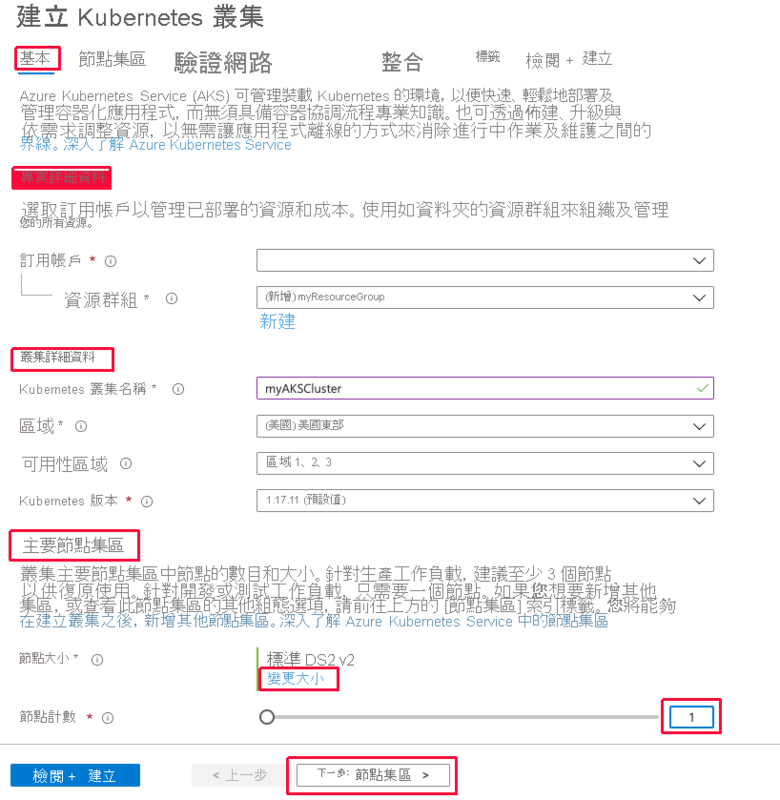 叢集詳細資料：選取 AKS 叢集的區域、Kubernetes 版本及 DNS 名稱前置詞。CLUSTER DETAILS: Select a region, Kubernetes version, and DNS name prefix for the AKS cluster. 調整大小：選取 AKS 節點的 VM 大小。SCALE: Select a VM size for the AKS nodes. VM 大小無法在 AKS 叢集部署完畢後變更。The VM size cannot be changed once an AKS cluster has been deployed. 選取要部署到叢集的節點數目。Select the number of nodes to deploy into the cluster. 本快速入門將 [節點計數] 設為「1」。For this quickstart, set Node count to 1. 節點計數可以在叢集部署完畢後調整。Node count can be adjusted after the cluster has been deployed. 完成時，選取 [下一步:驗證]。Select Next: Authentication when complete. 建立新的服務主體，或「設定」為使用現有服務主體。Create a new service principal or Configure to use an existing one. 使用現有的 SPN 時，您需要提供 SPN 用戶端識別碼和祕密。When using an existing SPN, you need to provide the SPN client ID and secret. 啟用 Kubernetes 角色型存取控制 (RBAC) 的選項。Enable the option for Kubernetes role-based access controls (RBAC). 這些控制項可針對 AKS 叢集中部署的 Kubernetes 資源提供更細部的存取控管。These controls provide more fine-grained control over access to the Kubernetes resources deployed in your AKS cluster. 根據預設，會使用「基本」網路，並啟用適用於容器的 Azure 監視器。By default, Basic networking is used, and Azure Monitor for containers is enabled. 選取 [檢閱 + 建立]，然後在就緒時選取 [建立]。Select Review + create and then Create when ready. 若要管理 Kubernetes 叢集，請使用 Kubernetes 命令列用戶端：kubectl。To manage a Kubernetes cluster, you use kubectl, the Kubernetes command-line client. kubectl 用戶端會預先安裝在 Azure Cloud Shell 中。The kubectl client is pre-installed in the Azure Cloud Shell. 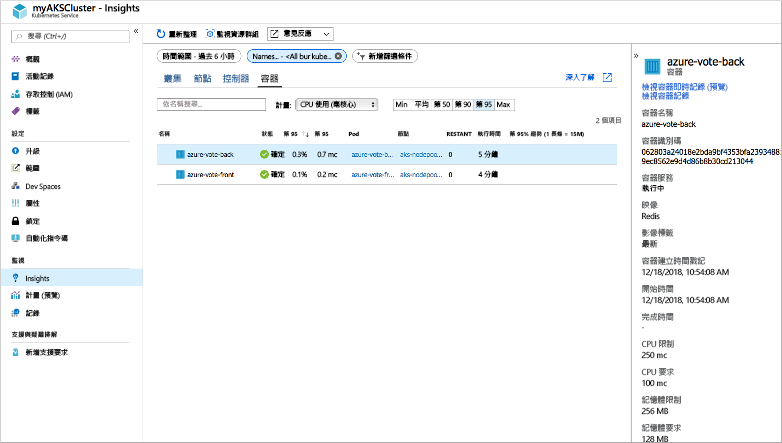 使用 Azure 入口網站右上角上的按鈕開啟 Cloud Shell。Open Cloud Shell using the button on the top right-hand corner of the Azure portal. 若要驗證叢集的連線，請使用 kubectl get 命令來傳回叢集節點的清單。To verify the connection to your cluster, use the kubectl get command to return a list of the cluster nodes. Kubernetes 資訊清單檔會定義所需的叢集狀態，例如要執行哪些容器映像。A Kubernetes manifest file defines a desired state for the cluster, such as what container images to run. 在本教學課程中，資訊清單可用來建立執行 Azure 投票應用程式所需的所有物件。In this quickstart, a manifest is used to create all objects needed to run the Azure Vote application. 此資訊清單包含兩個 Kubernetes 部署：一個適用於範例 Azure 投票 Python 應用程式，而另一個適用於 Redis 執行個體。This manifest includes two Kubernetes deployments - one for the sample Azure Vote Python applications, and the other for a Redis instance. 還會建立兩個 Kubernetes 服務：內部服務用於 Redis 執行個體，而外部服務用於從網際網路存取 Azure 投票應用程式。Two Kubernetes Services are also created - an internal service for the Redis instance, and an external service to access the Azure Vote application from the internet. 在本快速入門中，您會以手動方式建立應用程式資訊清單，並將其部署至 AKS 叢集。In this quickstart, you manually create and deploy your application manifests to the AKS cluster. 在更貼近現實的案例中，您可以使用 Azure Dev Spaces 快速地逐一查看程式碼，並直接在 AKS 叢集中進行偵錯。In more real-world scenarios, you can use Azure Dev Spaces to rapidly iterate and debug your code directly in the AKS cluster. 您可以跨作業系統平台和開發環境來使用 Dev Spaces，並與小組中的其他人一起工作。You can use Dev Spaces across OS platforms and development environments, and work together with others on your team. 執行應用程式時，Kubernetes 服務會向網際網路公開前端應用程式。When the application runs, a Kubernetes service exposes the application front end to the internet. 此程序需要數分鐘的時間完成。This process can take a few minutes to complete. 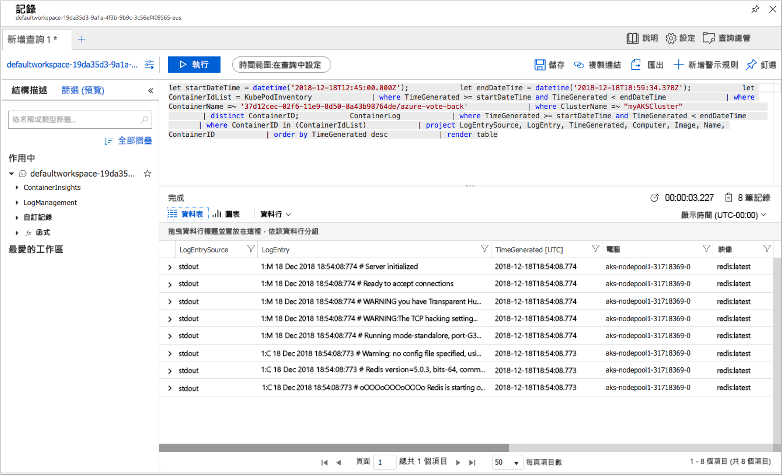 若要監視進度，請使用 kubectl get service 命令搭配 --watch 引數。To monitor progress, use the kubectl get service command with the --watch argument. 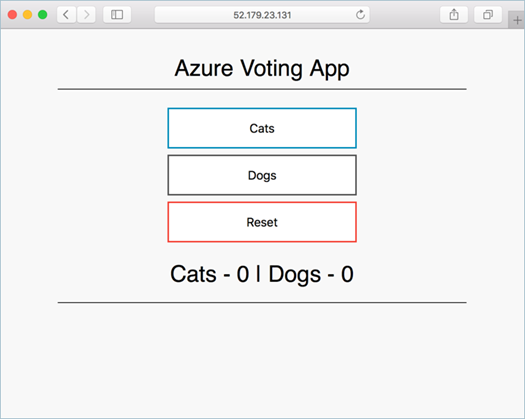 一開始，azure-vote-front 服務的 EXTERNAL-IP 會顯示為 pending。Initially the EXTERNAL-IP for the azure-vote-front service is shown as pending. 若要查看 Azure 投票應用程式的實際運作情況，請開啟網頁瀏覽器並瀏覽至服務的外部 IP 位址。To see the Azure Vote app in action, open a web browser to the external IP address of your service. 當您建立叢集後，就已啟用容器的 Azure 監視器。When you created the cluster, Azure Monitor for containers was enabled. 此監視功能可針對 AKS 叢集和叢集上執行的 Pod 提供健康情況計量。This monitoring feature provides health metrics for both the AKS cluster and pods running on the cluster. 選擇檢視容器。Choose to view the Containers. 若要查看 azure-vote-front Pod 的記錄，請選取容器清單右側的 [檢視容器記錄] 連結。To see logs for the azure-vote-front pod, select the View container logs link on the right-hand side of the containers list. 這些記錄包含來自容器的 stdout 和 stderr 資料流。These logs include the stdout and stderr streams from the container. 當您刪除叢集時，不會移除 AKS 叢集所使用的 Azure Active Directory 服務主體。When you delete the cluster, the Azure Active Directory service principal used by the AKS cluster is not removed. 如需有關如何移除服務主體的步驟，請參閱AKS 服務主體的考量和刪除。For steps on how to remove the service principal, see AKS service principal considerations and deletion. 在本快速入門中，預先建立的容器映像已用來建立 Kubernetes 部署。In this quickstart, pre-created container images were used to create a Kubernetes deployment. 相關的應用程式程式碼、Dockerfile 和 Kubernetes 資訊清單檔案，都可以在 GitHub 上取得。The related application code, Dockerfile, and Kubernetes manifest file are available on GitHub. 在本快速入門中，您已部署 Kubernetes 叢集，並將多容器應用程式部署到此叢集。In this quickstart, you deployed a Kubernetes cluster and deployed a multi-container application to it. 若要深入了解 AKS，並逐步完成部署範例的完整程式碼，請繼續 Kubernetes 叢集教學課程。To learn more about AKS, and walk through a complete code to deployment example, continue to the Kubernetes cluster tutorial.